Anthony Scaramucci is the Founder and Managing Partner of SkyBridge Capital, a global alternative investment and advisory firm. The firm has $5.8 billion in assets under management or advisement as of January 31, 2012. He was the cofounder of Oscar Capital Management, which was sold to Neuberger Berman, LLC in 2001 after building a managed account business and four hedge funds having in aggregate more than $800 million of assets. Upon Neuberger Berman's sale to Lehman Brothers in 2003, he served as a Managing Director in their Investment Management Division. From 1989 to 1996, Mr. Scaramucci worked at Goldman Sachs & Co., where he was appointed a Vice President in Private Wealth Management in 1993. Mr. Scaramucci is a recipient of the Ernst & Young Entrepreneur Of The Year 2011 New York Award in the Financial Services category and a board member of Warrior Gateway, The Lymphoma Foundation, and The Brain Tumor Foundation. He is also on the Board of Overseers for the School of Arts and Sciences at Tufts University and a member of the NYC Financial Services Advisory Committee and BENS (Business Executives for National Security). Mr. Scaramucci is the author of Goodbye Gordon Gekko: How to Find Your Fortune Without Losing Your Soul and a regular CNBC contributor. Most of the books I've read on investing are about as appealing as chewing on a cinder block. 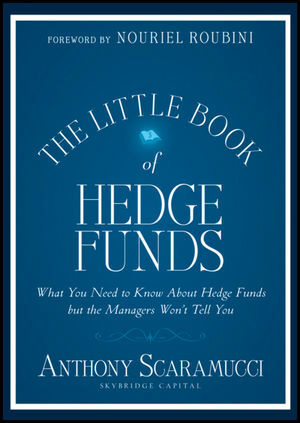 Fortunately, Anthony Scaramucci has written The Little Book of Hedge Funds, an entertaining and informative book without the typical Wall Street bombast, and it's nearly small enough to fit into my back pocket. Scaramucci is a regular contributor to CNBC's Fast Money, so he knows how to deliver a cogent message when he explains "the history and evolution of hedge funds and how they operate." The Little Book of Hedge Funds has everything from interviews with industry giants (Leon Cooperman) to a Due Diligence Questionnaire for potential investors. This is not a book loaded with charts, spreadsheets and algorithms but rather a straightforward anecdotal piece with something for everyone. Whether you're a neophyte who wants to learn the basics, an investment guru who'd like to pick up some gossip -- or more importantly -- someone who is considering investing their savings with a money manager, this is a worthwhile read. There are numerous comedy analogies throughout the book, and I found this one particularly amusing: "Mutual funds are Rodney Dangerfield, while hedge funds are Jon Stewart." I'm not sure how accurate that is, but it kept me reading from cover to cover.